My oldest is turning 5 next month! I can hardly believe it. I remember bringing him home from the hospital. Where did the time go? 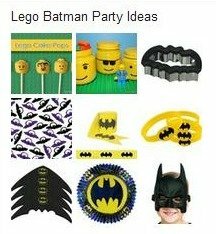 He has decided he wants a LEGO Batman themed birthday party. Yesterday, I made up his party invitations using My Memories Suite Software. The three extra characters in the upper left, bottom left and upper right corner is my son’s favorites from the game – Two Face, Man Bat and Killer Moth. 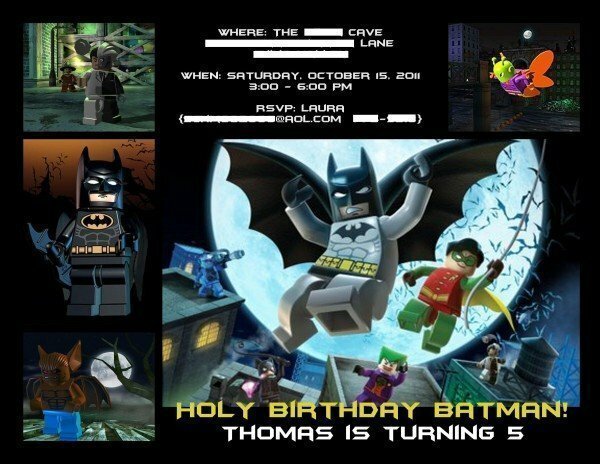 Funny story: I originally made the invitation with the Batman character you see on the left side. I thought it looked pretty good. So, I asked my son if he liked it. (It is, after all, HIS birthday!) He said, “No.” So I asked him what should be different. He told me he just wanted Man Bat on the invitation. Knowing that not everyone would know who Man Bat is, I told him no one would know what kind of birthday he was having if we only put Man Bat on the invitation. So, we went on the Lego Batman kid’s website and he showed me his three favorite guys. I found pictures of all them on Google Images and started playing around with my software to figure out how I could make the invitation look right. My son kept coming over to me and asking “How’s it going, Mom? Are you getting it all figured out?” It was really cute he was so concerned with my progress. And when it was all said and done, we had a winner! I am either going to have them printed at Walgreen’s as postcards or I may just have them printed out as regular photos and stick them in an envelope. I have been collecting ideas for this party on Pinterest. If you click the link below you can see all the ideas I have found! One more reason I love Pinterest – I have everything in one convenient place! What fun ideas have you done for a themed birthday party? Thank you so much for taking the time to link up! I loved reading more about you. I love Pearl Jam as well!! !